Our lab dedicates years of continuous research and outreach to helping operators with their anaerobic digesters. Now we're offering operators solutions for upsets and issues in under 2 days when you submit this form. Our team is here to give you fast and decisive answers, but will also stick with you until your digester is fully recovered. The success we've had treating anaerobic digesters has led to the development of a growing line of products for digester recovery and methane optimization. Mesophilic digesters temperatures should be maintained between 32-35°C (90-95°F). Temperature changes per day should be no more than 2-3°C (4-6°F) per day. A .5°C (1°F) change per day is ideal. Most anaerobic digesters are mesophilic. This is because mesophilic temperature conditions are easier to maintain then thermophilic. Mesophilic digesters require a consistent temperature between 32-35°C (90-95°F) as opposed to 50-60°C (122-140°F) for thermophilic conditions (Gerardi 127). Falling outside this range of conditions can cause methane production to slow down which leads to a volatile acid buildup. Generally the high end of the temperature range is preferable because it allows for faster biocatalyst function, sludge reduction, and methane production. An important consideration is to not allow any rapid change in temperature to occur. Mesophilic digesters should never change temperature more than 2-3°C (4-6°F) per day (Gerardi 91). In fact, some sources recommended only allowing a change of .5°C (1°F) per day. It is important that if the temperature of a digester drops, that its temperature is not recovered too quickly. This can very easily lead to an upset digester. Thermophilic digesters are typically operated between 50-60° Celsius (120-140° Fahrenheit). This higher operating temperature leads to a variety of advantages and disadvantages to the more commonly operated mesophilic digesters. The main reason thermophilic digesters are not more commonly used is due to the significantly higher energy input required to maintain a temperature above 50° C, but there are many other factors which could encourage or discourage the use of thermophilic digestion. The most important thing to know is that everything happens faster with thermophilic digesters, which includes upsets. Because of these pros and cons, thermophilic digesters tend to be less suited for domestic wastewater treatment, but can be very effective for COD reduction in consistent industrial waste. Thermophilic digesters require even more stable temperature and loading conditions than mesophilic digesters. Class A bio-solids production also could create a financial incentive which could compensate for high energy input. The increase in methane production can also reduce electrical costs of operating a thermophilic digester somewhat. In plants with inconsistent loading, benefits of thermophilic systems can be outweighed by an increased likelihood of upsets. Table represents pg. 96 in Microbiology of Anaerobic Digester (Gerardi) (converted to pounds). Care should be taken when adding micronutrients, because toxicity occurs in a digester at low concentrations. Other minerals (Mo, W, Se, Ba, Mn, and Cu) may be beneficial in very low concentrations, but additives for these minerals tend to be unnecessary. In order to function optimally, a variety of nutrients are required for anaerobic digesters. These nutrients are generally broken in categories of macro and micro nutrients. The primary macronutrients needed by bacteria are nitrogen and phosphorus. These two nutrients are required for protein production in cells. Sludge content should consist of around 12% Nitrogen and 2% Phosphorous (% of COD) (Gerardi 98). The main micronutrients required in an anaerobic digester are cobalt, nickel, and iron. These metals are necessary as biocatalyst activators for methane-forming bacteria. The minimum requirements for cobalt and nickel are 0.01% and 0.001% of COD respectively. Iron should have a minimum concentration of 0.2% of COD (Gerardi 96). Aquafix’s BioGas1 provide helpful amounts of these metals, as long as it’s added at recommended levels. Other metals such as molybdenum, tungsten, selenium, copper and barium may be of some use, but their use currently lacks any scientific verification of helping or hurting anaerobic digester issues. The other significant micronutrient required is sulfide. This is almost always present in sludge in much larger than required concentrations. A lot of digesters have problems with too much sulfur, so ferric chloride is used to precipitate some of the excess sulfur. Toxicity is a common issue in methane digesters with mixed waste. Since inconsistent waste enters the digester, it is impossible to predict exactly which sorts of toxins could show up and upset one’s digester. There are, however a number of toxins that commonly cause problems in digesters. Ammonia is generally abundant in high concentrations in anaerobic digesters. At recommended operating pH levels, ammonia remains a soluble NH4+ ion. This ammonium ion is only inhibitory by around 1500 ppm. 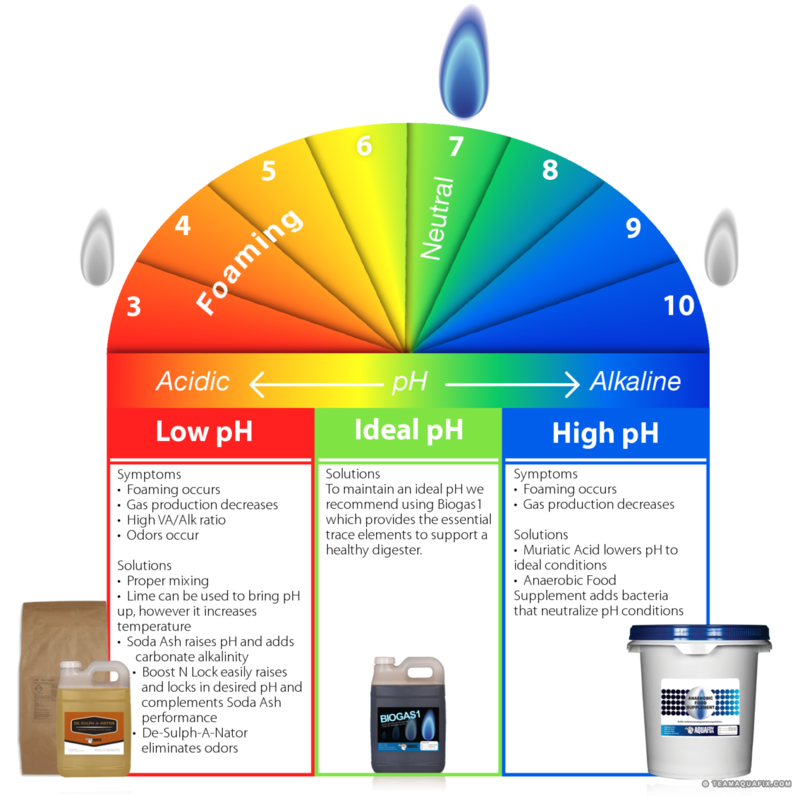 Problems arise when the pH gets over 7.2, and high concentrations of ammonium are present. This causes a buildup of soluble and sometimes insoluble ammonia. Ammonia (NH3) becomes toxic at 50 ppm. It is important to maintain some Ammonium, because 50-200 ppm NH4+ is beneficial as a source of nitrogen (Gerardi 107). If ammonia is present in high concentrations it can partially turn to ammonia gas which is dangerous to wastewater operators. Metals in too high of amounts can be a source of toxicity. Typical toxic metals include arsenic, cadmium, chromium (hexavalent), copper, nickel, zinc, and iron. Interestingly copper, nickel, zinc and iron are all beneficial nutrients in low concentrations so it is important to closely monitor conditions to see if metal toxicity is possible. Nickel becomes toxic at 1-2 ppm, copper and zinc start to become toxic from 0.5-1 ppm (Mignone 9). Iron becomes toxic at 5 ppm. Iron is unlikely to become toxic because it reacts with sulfide in digesters. The iron is beneficial because it reduces the potential of a buildup of H2S which is toxic when dissolved in digesters and a danger for operators. The only true method for removing toxicity from the system is to waste sludge from the digester. After operators do that, we recommend they use BioGas1 as their source for trace metals, so that they can carefully control the amount of each element being introduced into the digester. If you are working in a plant which typically deals with waste that contains certain specific toxins, it is possible to improve methane generating bacteria’s resistance to them. This can be done by long term exposure to small, gradually increasing levels of toxins. Bacteria can perform well in much higher concentrations of toxins than are typically associated with toxicity if acclimated. Bacteria can become acclimated to most substances. The main exceptions are chemical cleaners and sometimes antibiotics. Anaerobic Food Supplement: Methanogens can struggle to keep up with incoming waste, resulting in foaming and excess acid production. In anaerobic digesters, most common problems can be avoided by proper mechanical equipment and maintenance. A consistent process for mixing, retention times, and feed rates can significantly help digester function. Mixing an anaerobic digester can lead to many significant benefits. Proper mixing can help avoid localized high or low temperature pockets, or localized buildup of nutrients and toxins. This enables balanced function throughout a digester, and prevents toxins for accumulating above toxic values in spots. The problem with mixing is that it is difficult to mix a digester well enough to maintain optimal function, while not over mixing. Over mixing can lead to reduction of solution surface tension and an inversion of digester contents (solids accumulating over liquids). Both of these problems can lead to foaming in a digester, or make a foaming situation worse. Many digesters incorporate intermittent mixing to avoid this problem, but that can reduce digester function. Ultimately, slightly hindered digester function is better than excessive foam buildup. Monitoring and trial and error can help determine how much mixing is ideal. When experimenting with increased mixing, it is important to make sure to stop if foam is beginning to build up significantly. Retention times vary based on the solids contents in sludge being treated. Typically around 20 days is sufficient retention time for a mesophilic digester. Thermophilic digesters can potentially digest solids in 8 hours or less (Gerardi 154). Basically there is nothing wrong with long retention of solids, other than digestion speed will slow once the volatile solids content in the digester is low. Complete mixed anaerobic digesters have the same retention time for solids (SRT) and liquids (HRT). Some other types of digesters can recirculate the liquids and separate them from the solids. Liquids require less digestion time than solids due to lack of nutrients, but having too fast a HRT can lead to a washout of alkalinity and potentially methane-forming bacteria. Flow rate refers to the rate at which undigested sludge is entering and leaving a digester. A high flow rate can cause foaming because of inversion of solid and liquid in a solution causing solids to be on top of liquids. A maximum digested loading rate is around 450lbs of VA/1000 ft3 per day. Typically digesters operate lower than that to avoid foaming (30-50 lbs. of VA/1000ft3per day). If foaming is a problem the easiest short term fix is to reduce flow and mixing speeds and then look into long term solutions. Both these solutions could limit the productivity of a digester, but will help to avoid a substantial mess. Digesters lose their active capacity with extended use. Digesters that haven’t been serviced on a regular schedule will have accumulated grit and struvite crystals. Also digesters that have difficulty with mixing and heating may accumulate two to three feet of grease and trapped solids. This may result in a 20 percent reduction of actual digester capacity. The loss of capacity can gradually decrease digester function. It should be noted that cleaning digesters is a task that should be carried out by skilled professionals. Do not leave this task in the hands of inexperienced workers. The main key to spotting a digester upset is to consistently monitor alkalinity and biogas production. As long is alkalinity is maintaining around a ratio of 0.34VA:1 Alk, or better and biogas production is around 65-70% Methane and 30-35% CO2, then it is likely any digester will continue to function well. Environmental conditions, nutritional conditions, low levels of toxicity and effective conditions of operation, are the keys to maintain a healthy digester. As long as an anaerobic digester is properly monitored and maintained, it should almost always function effectively, and when something does go wrong it will be much easier to identify the problem. When a digester is working well, it is important to document all the operating conditions so they can be replicated later. If you are experiencing any anaerobic digester issues as described in this article or if you have any questions, contact us and we’ll be happy to help. 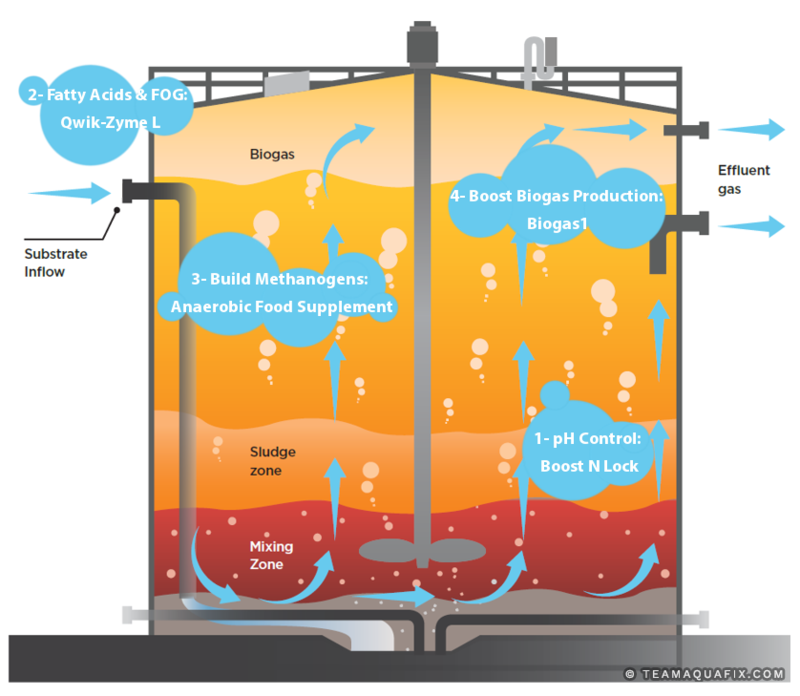 bacteria, operating conditions, and types of anaerobic digesters. comprehensive list of toxicities of various compounds and abilities of bacteria to acclimate to toxins. and Nitrous Oxide. Frontiers in Microbiology, 2012. Contains a study trace metal requirements in anaerobic digesters for methanogenesis. Ozturk. Istanbul: INTECH, 2011. Contains an overview of the various types of anaerobic digesters used in industry and wastewater treatment. Kim, M., Ahn, Y.-H., & Speece, R.E. (2002). Comparative process stability and efficiency of anaerobic digestion; mesophilic vs. thermophilic. Water Research, 36, 4369-4385. Labatut, R. A., Angenent, L. T., & Scott, N. R. (2014). Conventional mesophilic vs. thermophilic anaerobic digestion: A trade-off between performance and stability? Water Research, 53, 249-258.